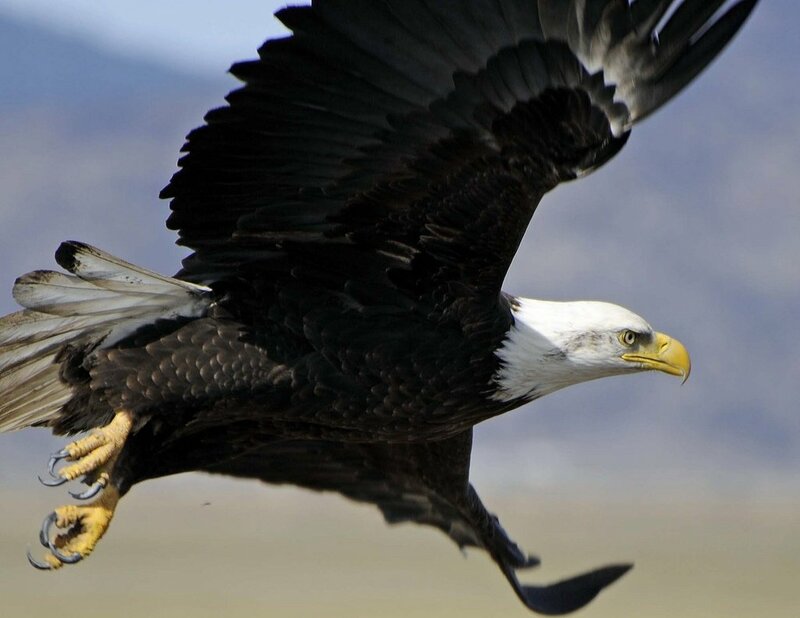 Our guest blogger is Goldenrod Foundation Advisory Board Member and talented wildlife photographer and videographer, Shawn Carey. He is the co-founder of Migration Productions and on the team that produced the stunning shorebird documentary, Epic Journeys. It’s 4:00 AM Saturday morning June 28 and time to get up and hit the road. Why so early? I am going to meet some friends and fellow photographers (Amanda, Mike and two others) for a morning shoot on Plymouth Long Beach. By 5:15 AM we have all assembled at the parking lot and are making our way to the Goldenrod Foundation‘s field station. Once we arrive tripods and camera bags are made ready for the trek onto the beach in search of any number of avian subjects for what we hope will be a productive morning of photography. As it turns out the weather is perfect: no wind, blue skies and beautiful early morning sunlight. These conditions are always a photographer’s dream and we have it. Adult Piping Plover scanning the wrack and sand for invertebrates to eat. As I make my way onto the beach I encounter several pairs of adult Piping Plovers all with young of various ages, some several weeks old, others just a few days old, and all making use of the low tide in search of food. One adult Piping Plover allows me to shadow it as the bird moved about, and in turn I am able to get some nice photos and a few good video clips. One of the more interesting observations during the 40 minutes I spent with this plover was its reaction when another plover crossed an imaginary line into its territory. Mind you, it was low tide, and there was a huge exposed area for feeding, but apparently they (Piping Plovers) have their own rules when it comes to feeding. You stay in your area and I will stay in mine, cross the line and it’s time to spar. 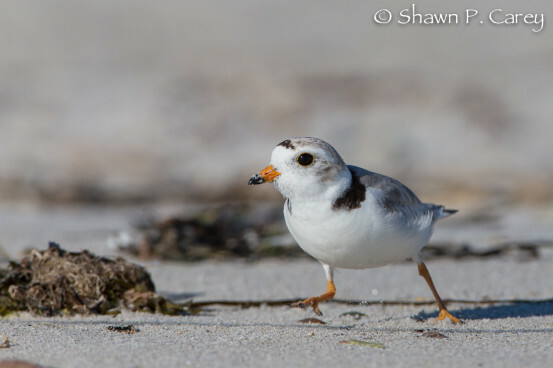 Or as much sparing as Piping Plovers can have. After a vocal warring and flying towards the offending plover, it’s time to return to the business at hand, feeding – after all low tide does not last. 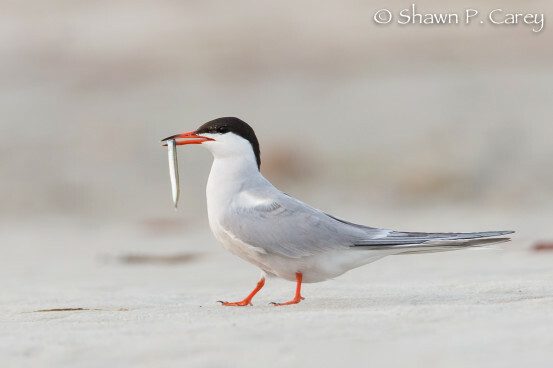 Common Tern with fish for its young. After my time with this one plover, I continued down the beach towards the Common Tern colony where my friends had been photographing. 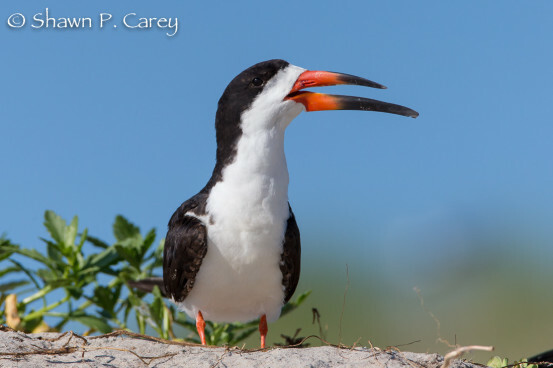 They had found the one pair of nesting Black Skimmers about midway in the area of the terns. The nest was not visible; it was hidden on the other side of a small berm of the sand dune. However, the adult birds took turns standing on the top of the dune. This allowed for very nice views and photos. I spent the remainder of my time in this area with the skimmers or trying to get a few flight photos of the terns and they flew in with small fish to feed their young or chasing Laughing Gulls. Just after 9:00 AM we were finished for the day and made our way back to Goldenrod, packed up Amanda’s truck and off we went. A very HAPPY group of photographers spending a morning together at a very special place, Plymouth Long Beach: the summer home for nesting plovers, terns and gulls. Black Skimmer keeping watch from the top of a dune.